This journey is about getting past the Incas, and seeing the ancient empires of Peru that shaped the future. It will change how you see Peru through new concepts and access to new areas such as Kuelap, one of the largest ancient stone complexes in the western hemisphere. It has been referred to as the Machu Picchu of the north, even though it is rarely visited by travelers. Peru experiences two very distinct seasons, wet and dry - terms that are more relevant than "summer" and "winter." Peru's high season for travel coincides with the driest months: May through September, with the most visitors in July and August. May and September are particularly fine months to visit much of Peru. 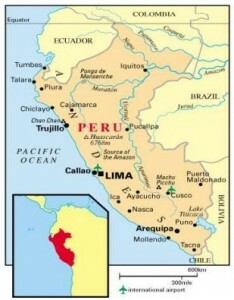 Peru is in the same zone as U.S. EST (GMT -5 hours). Nuevo Sol (S/), divided in 100 cents. Coins come in 5,10,20 and 50 cents. Banknotes are in denominations of 10 20 50 100 and 200. US dollars are welcome at most shops, restaurant and services stations at the current exchange rate. Having exploded onto the global food scene, Peru is now widely regarded as one of the world’s principal culinary travel destinations. The country’s dramatically diverse geography, rich ethnic make-up and long culinary history inspire an array of colorful dishes. This morning you set out to sample the flavors that have helped put Peru’s cuisine on the world cuisine map. Visit a local market, traditional bodegas and artisan eateries that collectively showcase some of the finest of Peru’s produce. Discover new ingredients and tastes while you learn more about Lima’s trailblazing gastronomic status. Begin at a lively local market brimming with ingredients that are central to Peruvian cuisine such as fish, crucial to the classic Peruvian Ceviche; potato, of which Peru has surprisingly more than 3,000 varieties; and Andean “super foods” such as cañihua, sacha inchi, maca and kiwicha. Then there are the native fruits such as chirimoya, mamey, and camu. After a cup of Peruvian coffee, head to a local food-haunt such as La Preferida. This particular bodega is located in a quiet residential neighborhood and is popular with locals for its wide variety of Peruvian classics. Sample mini causitas, pulpo al olivo, almejas al balsámico, cevichito mixto and choritos a la chalaca served tapas-style at the bar. This morning, you will be transferred to the airport to catch you flight to Jaen, which takes about an hour and a half. Upon your arrival, set out on a five-hour to Leymebamba. Along this scenic route, you notice the surroundings change from fertile agricultural valleys with rice paddies and coconut groves to steep ravines as you climb into the mountains. The route follows the Marañón River briefly and then travels along the Utcubamba River for most of the journey. Depending on time, you will have opportunities to stop along the way to stretch your legs, take photos of the scenery, rivers, a waterfall and some largely hidden pre-Inca tombs in the cliff side. Today, enjoy a box lunch along the way. This morning, visit the Tombs of Revash high in the hills of Peru’s northern cloud forest. The collection of tombs from the pre-Incan Chachapoya civilization sit on the edge of a limestone cliff. Built with mud-set stones, they resemble houses painted red and white, and collectively form miniature villages along the cliff face. In the 1980s, archaeologists discovered 12 skeletons, along with musical instruments and tools made from bone. Along with the tombs, there are paintings of animals, people and geometric designs. To explore the area, you drive a winding road through the hills with scenic views of the landscape to the village of San Bartolo, where you pause to register to visit the site. From there, you walk about half hour to 40 minutes along a well-maintained trail, mostly paved. It does get steeper and uneven towards the end. Your expert guide will lead you on this excursion into ancient Peru. The mausoleums were used as collective tombs for the wealthy and powerful of their society rather than individually. Below, there is a small sheltered viewpoint offering a great perspective of the tombs above. Your guide will explain the construction and importance of the tombs, and set up a telescope so you can enjoy an up-close look at all the detailed painting and designs. You will then return to the village via the same path where your vehicle and driver will be waiting to take you back to the hotel for lunch. This afternoon explore the Leymebamba Museum in, which was established after the discovery of burial tombs and mummies on a remote cliff above Laguna de los Cóndores in the 1990s. It required an arduous ten-hour journey by mule from Leymebamba to reach the site. Also created by the pre-Inca Chachapoya civilization, this was a sacred place to honor the dead. Looters badly damaged it looking for sellable treasure, the NGO group Centro Mallqui embarked on an emergency salvage mission, removing the contents of the tombs and taking them to a lab in Leymebamba for urgent conservation work. The findings were deemed so special that the museum was created for their protection. Kuelap is the most important of the pre-Inca Chachapoya sites. It is actually one of the largest ancient stone complexes in the western hemisphere. The great fortress with more than 400 hundred interior buildings and massive exterior stone walls reaching upwards of 18 meters/60 feet in height, is also called the Machu Picchu of the north. Few travelers ever see this remarkable place due to its remote location. The imposing site is some 600 meters/1,968 feet in length and sits at 3,000 meters/9,843 feet above sea level on a ridge overlooking the Utcubamba Valley. This morning, you drive about an hour to the village of Tingo. Then, set out via a winding, unpaved road that slowly ascends the mountains, passing by beautiful views of the valley below. A new cable car, opened in early 2017 to improve access to the site. The views are incredible on the way up. Either way, once on top, you enter the site and walk about half an hour to the archaeological site on a paved uphill path. Horses are available for those who may need assistance. Enjoy a full tour and exploration of the impressive site led by your expert private guide, discussing the history and significance of the fortified city, and taking in the panoramic views of the Chachapoyas cloud forest in the valleys below. Along the way, you will enjoy a box lunch this afternoon. Continue your drive about two hours to Cocachimba. On the way, you stop to see the hillside painted warriors sarcophagi of Karajia. The mummies of famous warriors were entombed inside the sarcophagi and placed on cliffs with the skulls of their enemies displayed on top. Just 60 km/37mi northeast of Chachapoyas at an altitude of 2,072 meters/6,798 feet, the site is unreachable in the limestone cliff high above the path. The funeral tombs of the “ancient wise men” stand two and a half meters/8.2 feet-tall, and date back to the 15th century. They resemble limbless torsos, with large heads and exaggerated jawlines and offer tantazling hints of an ancient world. Even though their remote location has preserved them from destruction, an earthquake destroyed one of the original eight sarcophagi in 1928. Chachapoya people, also called Warriors of the Clouds, carved these sarcophagi just before the Incans conquered their civilization in the 1470s. They mummified important individuals of their civilization in these sarcophagi, called “purunmachus,” which are painted white and overlaid with feathered tunics and male genitalia, which displays the gender of the deceased, in yellow ochre and two red pigments. Today you set out to discover Gocta Waterfalls. In 2005, an expedition led by a German explorer prompted the measurement and documentation of the falls, which then became the third highest in the world! Its official height and rank has since been contentious, and, depending on your source, the ranking seems to vary from the third to the 16th highest. Regardless of its status, it is an incredibly impressive and beautiful sight. During your hike through the cloud forest, you encounter a variety of vantage points to view the spectacular falls. The well-maintained path is easy and provides a stable and scenic journey. You should be in generally good physical condition for the hike, which at a good pace takes about two and a half hours, one-way. Some sections have steep inclines, and horses can be hired for part of the journey to the falls or can be pre-arranged for the way back if you’ve had enough walking by then. This morning, be prepared to discover one of the most truly remarkable and mythic sites in Latin America and, indeed, the world. This full-day exploration takes you into the historic sanctuary of Machu Picchu, probably the premier expression of Incan architecture. *The Machu Picchu exploration, the prime attraction of this region and a national park with restricted access, combines explora and third-party services due to the inherent restrictions of the site. This exploration has an additional cost and must be confirmed with the reservation team at least 30 days before the beginning of your stay. Land price, per person, double occupancy: From US$600 per person per day.